I’m sure we all know someone who has been affected by a life threatening illness. Myself and our family run business would like to raise as much money as possible for the Kirkwood Hospice in Huddersfield, who do a fantastic job in helping support patients, family and friends. Phil Collins (Director) took part in a sponsored Skydive on 13th July 2014 at Hibaldstow which was not only a lifelong ambition but raised money for a worthwhile charity. The total cost to take part was £395 which includes a £195 minimum donation to Kirkwood Hospice. 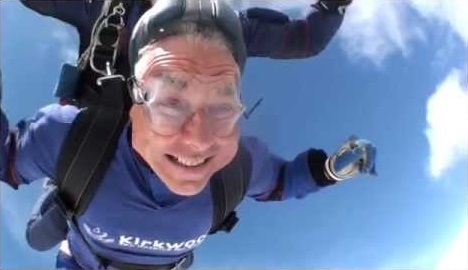 Phil personally payed the cost of the Skydive which was £200 to Target Sports and an amount of £200.00 has been donated by our company Floor To Ceiling Fitted Furniture of Huddersfield, this ensures that every penny raised will go direct to Kirkwood Hospice of Huddersfield. Thank you to family, friends and customers who took the time to sponsor Phil. Many thanks for wonderful service and a excellent job everything looks absolutely fabulous. Our best regards to everyone @ Floor To Ceiling. Trading since 1978, we have always been committed to delivering excellence for all our customers, Manufacturing high quality products and providing a level of aftercare that has earned us a fantastic reputation. © 2016 Floor To Ceiling. All Rights Reserved.